Readers might be surprised after all the hoopla and PR surrounding the recent Climate Change Conference in Paris to learn that the growing part of the world considers coal to be their answer to generate electricity. The Paris agreement does not change this. Over 2,400 coal-fired power plants are under construction or being planned around the world, but not in the United States, thanks to President Obama’s Environmental Protection Agency (EPA) and its onerous regulations. China is building 368 coal-fired power plants and planning a further 803 and India is building 297 and planning 149. Together these two countries are building or planning to build two-thirds of the coal-fired plants planned worldwide over the next 15 years. (See chart below.) Other countries, such as Indonesia and Japan, are also planning to build coal-fired power plants. Japan is planning to build 45 very efficient coal-fired plants to replace electricity that was supplied by nuclear plants before the tsunami hit in 2011. In the first nine months of this year, state-owned companies received preliminary or full approval to build 155 coal power plants that have a total capacity of 123 gigawatts. That capacity is equal to 15 percent of China’s coal-fired power capacity at the end of 2014 and almost 40 percent of the operational coal power plants in the United States. If the 155 plants operated at typical levels for new projects, they would emit 560 million metric tons of carbon dioxide annually–equal to Brazil’s total energy emissions. 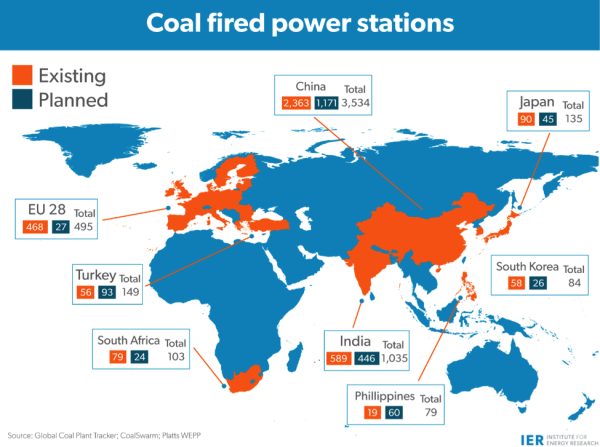 According to the chart above, China will have 23 times those plants (over 3,500 coal-fired power plants) when construction on the planned and under construction coal plants is completed. China’s priority is to continue raising the standard of living of its citizens. With China’s economic growth rate declining a bit, China will not risk its further decline by curtailing the use of the fossil fuels upon which its economy depends. As a result, China will only commit to continue to improve its energy efficiency (energy consumption per unit of GDP). China will continue to use fossil fuels to grow its GDP since economic output and fossil fuel use are connected. The country’s only concession is to reduce its fossil fuel use from 90 percent to 80 percent, at which point its distribution of fossil fuels to its total energy use will be similar to that of the United States. However, while the percentage of fossil fuels will be similar to that of the United States today, China will be using much more total energy than the United States. Further, reducing carbon dioxide emissions will not curb the air pollution plaguing China’s major cities. To deal with the smog, China needs to add scrubbers to its coal-fired power plants to reduce criteria pollutants (e.g. sulfur dioxide, nitrogen oxide) that are the causes of the smog. These scrubbers, however, will increase carbon dioxide emissions because they need additional energy to operate. China accounts for over a quarter of the world’s industrial emissions of greenhouse gases. China’s consumption of coal grew by almost threefold from 2000 to 2013, consuming about half the coal used worldwide. China has considered itself a developing nation with regard to climate change negotiations for over 20 years. It is leading the demands from developing nations that Western nations pay $100 billion annually into a climate fund for the developing countries to build renewable technologies. After 2020, they expect Western nations to contribute 1 percent of their GDP to the fund to compensate for the damage allegedly caused by their years of industrialization. This is despite China providing billions to other developing countries. China has set up a $100 billion, 57-nation Asian Infrastructure Investment Bank, created a separate $40 billion fund at the end of last year to help pay for investments in countries along the ancient Silk Road, and created a $3.1 billion “China South-South Climate Cooperation Fund” to provide direct assistance to developing countries. 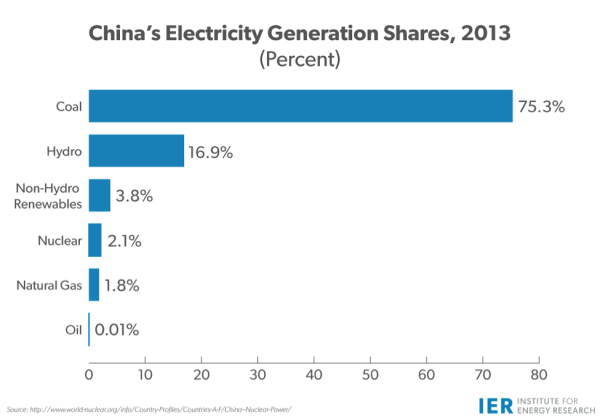 China is also building more renewable and nuclear energy capacity. By 2020, China expects 15 percent of energy consumption to be met by sources other than fossil fuels. The growth in renewables and nuclear power is expected to meet an estimated 3 to 4 percent annual growth in China’s electricity demand. However, while utility contracts in China guarantee that coal-fired plants operate a minimum number of hours to sell power to the grid, renewable sources have no such guarantee. While wind power capacity has grown, so has wasted wind power, i.e. wind power curtailment. According to China’s National Energy Administration statistics, in the first half of 2015, the rate of curtailment of wind energy was 15 percent–almost twice that of the same period in 2014. China currently operates 30 nuclear power reactors, mostly along its east coast, accounting for 2.4 percent of the nation’s electricity consumption. Twenty-one additional plants are under construction, and the World Nuclear Association counts 135 proposed reactors under serious consideration. If constructed, China could become the world’s biggest producer of nuclear energy. Chinese officials want nuclear power to generate up to 10 percent of China’s electricity by 2030. To meet that goal, China must add six to eight nuclear reactors every year over the coming decade. China has no intention of sacrificing economic growth by reducing its carbon dioxide emissions. And, it has no intention of eliminating coal-fired power plants from its electricity portfolio, as the United States has decided to do through EPA regulations. Further, China does not sacrifice coal-fired generation for wind power. Rather, wind power is curtailed for coal-fired generation. Clearly, despite the growth in nuclear and non-hydro renewables, China will remain a coal generating nation for decades to come.